CANBERRA, Jan 14 (Reuters) - Raging wildfires destroyed at least another 28 homes and licked at Australia's leading optical space observatory on Monday, officials said, but spared giant telescopes that have mapped far-away galaxies and discovered new planets. Less fortunate were a father and son who police arrested after a fire was lit deliberately to destroy illegal drug laboratories they were alleged to be running in dense bushland. Police were closing in on the drug labs when the fire was lit. More than 140 fires are burning across vast areas in the north and west of New South Wales state (NSW), Australia's most populated state, and in the island state of Tasmania despite cooler weather giving firefighters some respite. A searing heat-wave had fuelled the fires over the past week. Only one person, an elderly firefighter working alone in Tasmania, has died so far in the fires. 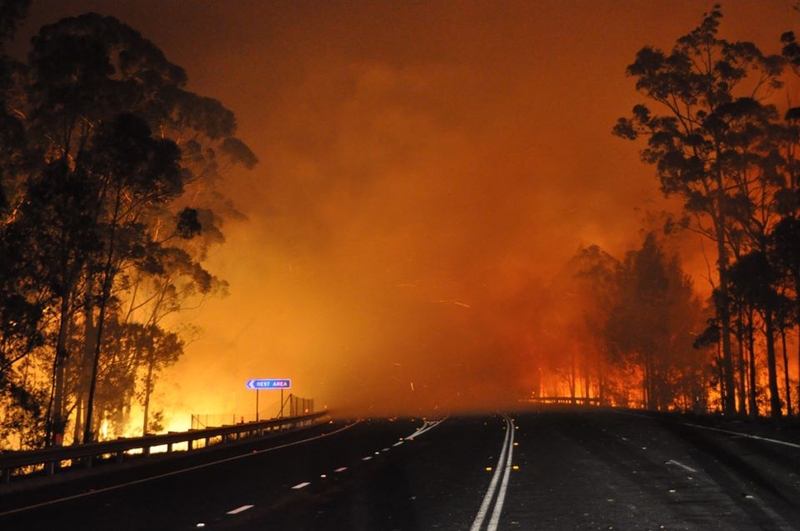 The biggest blaze, with a perimeter of 100 km (60 miles), destroyed around 40,000 hectares (100,000 acres) of bushland and 28 homes around the Warrambungle National Park in NSW. That fire also forced the evacuation of the Siding Springs Observatory, which houses 15 major telescopes. Cameras inside the mountain-top observatory showed large flames and thick smoke sweeping over it. There appeared to be little damage to telescopes and dishes but scientists have been unable to visit the site yet to assess any damage. "We do not yet know what impact the extreme heat of the ash might have on the telescopes themselves," said Erik Lithander, acting vice chancellor of the Australian National University, which operates the observatory. The fire damaged five buildings at the observatory, including accommodation for visiting astronomers, but Lithander said scientists were confident the telescopes would still work. Siding Springs is home to the 4-metre (13 ft) Anglo-Australian Telescope, which has surveyed 200,000 galaxies and was instrumental in confirming the existence of dark energy. That discovery led to Australian Brian Schmidt sharing the 2011 Nobel Prize for physics. The observatory has also helped find more than 30 new planets over the past decade and is being used to map the southern sky. In Sydney, police arrested two men late on Sunday over a fire that broke out in the Blue Mountains National Park west of the city last week. The fire destroyed more than 50 hectares of bushland in the Blue Mountains, a popular tourist destination. Police said they had been aware of the illegal, outdoor drug labs but were forced to postpone a raid due to the extreme fire danger in the area last week. "The two sites ... were only accessible by foot and required police to trek through tick, leech and snake-infested scrubland to reach them," NSW police said in a statement on Monday.